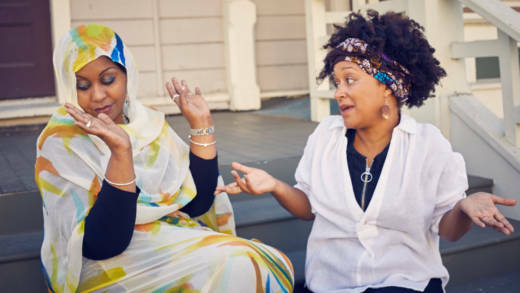 Hana Baba and Leila Day are journalists in the Bay Area who often found themselves in the newsroom chatting about their black identities: Baba is Sudanese American and Day is African American. They've turned those conversations into a podcast called "The Stoop," which explores the discussions black people have about what "it means to be black, and how we talk about blackness." Baba and Day join us to discuss their project and the conversations that spurred it: everything from being told they "sound white" to whether wearing traditional African prints constitutes style or cultural appropriation. Leila Day, co-producer and co-host, "The Stoop"
Hana Baba, co-producer and co-host, "The Stoop"